On the occasion of an Odalan, or temple anniversary, Balinese arrive at an open bale in front of the temple shrine balancing huge banten offerings atop their heads. Banten are beautiful towers--which can weigh up to 50 pounds--skillfully erected by layering basic foods in patterns that are aesthetically pleasing; flowers and decorations carved out of palm leaf make a glorious crown. The Balinese believe that gods consume the essence, or sari, of these offerings. 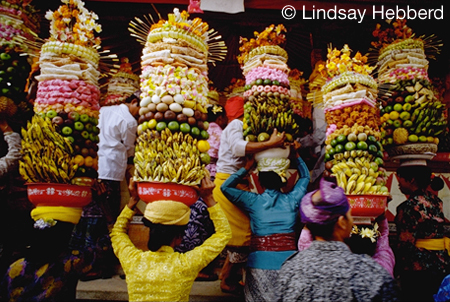 After a priest blesses the banten and prayers are made to complete the ritual, the women return home with their edible sculptures to select items to feed their family.